I spent the day, yesterday, in Franklin, TN with a few of my brothers and sisters in Christ. Here are some thoughts that I had. First of all, I want to say that I was confronted by the Holy Spirit (more on that later). I was looking forward to Honesty:Death to Performance, mainly because I like being around Acts29 guys, but also because we would get to hear from Ray Ortlund Jr., Ed Stetzer, Scott Thomas and Jamie George. The subject matter was secondary to being able to hear from these guys. Something turned after we got there and I found myself being confronted with my sin. The sin that so easily entangles me is my lust to gain approval from others. I have struggled with it most of my Christian life (prior to coming to Christ it wasn't a "problem" per se, it was just a symptom of my unbelief). In some ways my pride of wanting people to like me (sin) was fed by various things in my story, but nowadays the sin manifests and feeds itself through my career (ministry). I always want the parents in our youth group to like me and I want their kids to like me. I want the elders and deacons to approve of what I do. I want to be on the "right" side of certain theological discussions so that people respect me or like talking to me. I steal glory from things like sports teams or movies or bands so that others will identify me as one of their own and thus like me (living in Alabama with two SEC teams to choose from makes this complicated). My job is one that requires interaction with people and this feeds the addiction of wanting people to "like" me. It's not enough that people respect me or whatever; it's that I want them to really like me. The other edge of the sword is that I also struggle with the sin of self-pity or self loathing. I feel that I don't measure up to my own expectations and the bully of it is that I am the one setting those expectations. When I was a kid, I would punish myself before my mom could get to it. I would put myself in the corner or whatever, so my mom tells me. In some ways I still do this, only I do it with my Father in heaven. I become aware of my sin and instead of mortifying the sin I punish myself in various ways or I would even view things not going my way as God's tangible punishment. Yesterday, God met me in Franklin, through his men. As they unpacked (as Ed Stetzer would say) what Gospel centered living, and for me ministry, looks like I found the grace of God running deep there. I found that I had been caught up with performance in my head. I disguise it by saying things like, "I wish I had more kids in our Sr. High youth group". The sin behind a comment that can actually be viewed as good, is at the heart of that I am really believing the lie that God isn't sovereign and has precisely who he wants in my life. Could I do more? Sure. But do I trust that what I am doing is given to me by God to do and He is the one in control of the results? 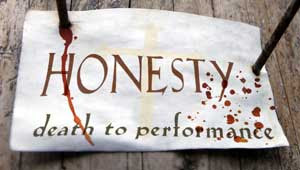 No, if I am honest, I don't trust - this is sometimes called unbelief. Yesterday, I fell into the depths of His mercy. I heard things that I had probably heard before. The Gospel isn't new to me. However, it is still as much needed for me today as it was when He began this good work in me. The Gospel isn't just the beginning of my Christian walk, it is the middle and the end as Ed Stetzer put it; it is the journey to live out who I am in Christ; from performance (to please God) to response to what God has done, namely Jesus' gospel(this pleases Him). That gospel being the life, the death, and the resurrection of Jesus for the glory of God and my gain. Yes, my gain. Jesus' propitiation for my sin covers these sins too. The thought that God approves of me because of Jesus is overwhelming but so true. Gospel. There is nothing that I can do to make him love me any more and there is nothing that I can do that would make him love me less because that love is found in Jesus. I am in Him and therefore the Father sees Jesus when he looks at me. That is good news. And it is grace. That which I couldn't do Jesus did. That is a release of a lot of pressure. Ed Stetzer said, the gospel is not about getting people to turn over a new leaf, but for them to embrace new life. I am that person. On the light hearted side - I don't know if I should say I liked the post? Brother I'm grateful His grace is sufficient. I find myself saying similar things that express my own doubts about His sovereignty. Keep learning and experiencing His love and His plan for your life. Thanks Dale. I really appreciate that you read my blog, even though I always say, "nobody reads my blog." You are not a nobody. That was a good post brother. I can relate well. Sounds like a good conference, which message would you recommend?